The Electronic Cultural Atlas Initiative was formed to encourage scholarly communication and the sharing of data among researchers who emphasize the relationships between place, time, and topic in the study of culture and history. In an effort to develop better tools and practices, The Electronic Cultural Atlas Initiative has sponsored the collaborative development of software for downloading and editing geo-temporal data to create dynamic maps, a clearinghouse of shared datasets accessible through a map-based interface, projects on format and content standards for gazetteers and time period directories, studies to improve geo-temporal aspects in online catalogs, good practice guidelines for preparing e-publications with dynamic geo-temporal displays, and numerous international conferences. The Electronic Cultural Atlas Initiative (ECAI) grew out of discussions among an international group of scholars interested in religious history and area studies. It was established as a unit under the Dean of International and Area Studies at the University of California, Berkeley in 1997. ECAI's mission is to promote an international collaborative effort to transform humanities scholarship through use of the digital environment to share data and by placing greater emphasis on the notions of place and time. Professor Lewis Lancaster is the Director. Professor Michael Buckland, with a library and information studies background, joined the effort as Co-Director in 2000. 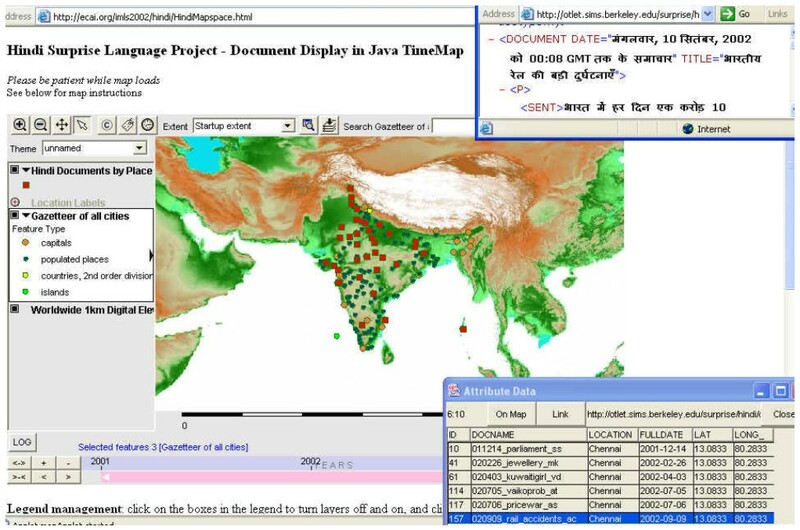 Assistance from the Lilly Foundation, the California Digital Library (University of California), and other sources has enabled ECAI to nurture a community; to develop a catalog ("clearinghouse") of Internet-accessible georeferenced resources; to support the development of software for obtaining, editing, manipulating, and dynamically visualizing geo-temporally encoded data; and to undertake research and development projects as needs and resources determine , . Several hundred scholars worldwide, from a wide range of disciplines, are informally affiliated with ECAI, all interested in shared use of historical and cultural data. The Academia Sinica (Taiwan), The British Library, and the Arts and Humanities Data Service (UK) are among the well-known affiliates. However, ECAI mainly comprises individual scholars and small teams working on their own small projects on a very wide range of cultural, social, and historical topics. Numerous specialist committees have been fostering standardization and collaboration by area and by themes such as trade-routes, cities, religion, and sacred sites. An online catalog of research findings and other shared resources known as the ECAI Metadata Clearinghouse has been under development since 1998 . The clearinghouse allows collaborators to register datasets for shared use by providing bibliographic and descriptive metadata for resource discovery as well as access metadata ("connection metadata") for delivering sets of data. The ECAI metadata is based on Dublin Core, with extensions for temporal and spatial coverage and other ECAI-specific metadata elements. The metadata provided in the clearinghouse makes it possible to search for datasets using a map interface, a time bar, and by keyword or topic. The map interface and time bar are one way to find datasets belonging to international collaborators who speak different languages. The use of standards such as Dublin Core, when they are available, complemented by research and development where no existing standard meets our needs, has become a recurring pattern for ECAI. Since easy-to-use software for downloading data and creating dynamic map displayswhile also showing change through timewas not available, ECAI has supported development of the TimeMap® application at the Archaeological Computing Laboratory, University of Sydney. TimeMap® and the ECAI Metadata Clearinghouse, used together, enable researchers to discover and download datasets contributed by different researchers and overlay them to create dynamic maps. The time bar feature and the switching on and off of layers allow researchers to visualize the data in various ways. Intellectual property rights for TimeMap® are being transferred from the University of Sydney to open source , . In order to display datasets in the TimeMap® software, records representing objects or events must be identified with respect to time and place. For the software to work, the places identified in the data must be georeferenced. While some ECAI collaborators make sophisticated use of geographic information systems (GIS), create their own base maps, and routinely produce data with latitude and longitude attributes, others create data that makes heavy use of placenames that were collected in the course of research on historical texts or fieldwork. These placenames are multilingual, representing the languages of international collaborators and the languages of historical sources, and they are recorded in a variety of scripts. They may also be contested among various sources or by different cultural or political entities. For this latter case, gazetteers play an important role in ECAI's research and collaboration efforts. Gazetteers are tools for disambiguating placenames by associating them with latitude and longitude attributes, which is necessary for display in the TimeMap® system. For ECAI, gazetteers are both tools and datasets of interest. In 2001, ECAI received a one-year grant from the National Science Foundation (ITR grant #0114019) to examine the requirements for creating and using multilingual digital gazetteers for scholars in history and the humanities. Partnering with the Academia Sinica Computer Center in Taiwan, we examined the requirements for documenting placename data and the feasibility of creating multilingual feature type thesauri (describing types of places) and gazetteer services for the ECAI community , . ECAI selected the Gazetteer Content Standard (GCS) of the Alexandria Digital Library (ADL) as the basis for our work . We found that the first version of the standard was inadequate for our needs in documenting variation in placenames, spatial footprints, and feature types over time and/or on the basis of the source or text consulted. The requirements we submitted on the basis of this project were incorporated in version 3.2 of the ADL GCS . We also adopted the concept of a shared Feature Type Thesaurus (FTT) from ADL, but we were concerned that the ADL FTT was inadequate for specialists who needed more specific terms for things like Buddhist temples or British canal archaeology, but also not generic enough to translate the feature type concepts into multiple languagesa basis for interoperability in a multilingual service. Our efforts to come up with a generic set of terms for that purpose were not entirely successful. Although we came up with an initial list that we believed would work as well in English as in Chineseour target language for this projectit was hard to reach a consensus on such a list among ECAI members. In the course of the yearlong project, we created a test multilingual implementation of the ADL gazetteer service protocol  using data from the gazetteer of Taiwan under development by Academia Sinica and Taiwan data from the ADL gazetteer. We set up a database using Unicode at Berkeley and succeeded in using the service protocol to query and return gazetteer entries for Taiwan in Chinese, English, and transliterated Chinese. The results of the testbed, together with version 3.2 of the ADL GCS, gave us the experience and raw materials needed to embark on a new gazetteer project in conjunction with the Atlas of Chinese Religion project funded by the Luce Foundation in 2004. Collaborators are currently culling Tibetan and Chinese placenames associated with Buddhism for a gazetteer that will form part of the atlas. Partners on this project include the Tibetan and Himalayan Digital Library at the University of Virginia  and the Chinese Historical GIS project at Harvard University , among others. In the course of our work on gazetteers, we also began to think of how we might use named time periods (e.g., Civil War Period) in conjunction with a gazetteer. Although we need to be able to provide dates for the existence of a particular historical place, those dates may be imprecise or may take the form of a named time period. A student project at Berkeley's School of Information Management has continued ECAI's initial exploration of the use of named time periods . The categorization of information by time period is a ubiquitous organizational device. And just as gazetteer entries have a period aspect, time periods may have a geographical aspect. When the Neolithic period was depends on the culture and, therefore, the region. The ideas of the Italian Renaissance moved through Europe at different times, so that what we might call the Renaissance in France and the Renaissance in the Netherlands are not exactly contemporaneous. Furthermore, the term renaissance can indicate a period in the twelfth century in Europe, the 1920s Harlem renaissance in the United States, and other periods. Time period terms also vary culturally: the term Great Patriotic War is used in Russia to refer to Soviet involvement in the Second World War, but this period is just part of World War II from the U.S. perspective. Much as the geospatial coordinates in gazetteers support the making of maps, time period directories can support the creation of timelines. Just as a map allows one to see what else is in the same area, time periods and chronologies (such as HumanSaga , Wikipedia's List of Themed Timelines , and others noted in ), enable one to see what else was happening around the same time. We have been working on the design of a directory of time period names and hope to have an online prototype soon. It closely resembles, in structure, a gazetteer. Library catalogs are well-designed for searching by author, by title, and by topic, but not for searching by place. People want to learn about the castles of Quercy, hiking in the Himalayas, and so on, but searching by place is limited. One can search for placenames in titles or in subject headings, but the geographical headings and the geographical subdivisions of the Library of Congress Subject Headings (LCSH) tend to be political jurisdictionsprimarily countries, states, and cities. The names, the boundaries, and the political structures of these entities tend to be unstable over time. This situation is generally acceptable for current affairs and political topics, but provides limited help for scientific, historical, and narrowly local searches when the interest is in a geographical region (space) rather than in a geopolitical unit. Geographical coordinates, along with feature type codes, are effective in disambiguating different places with the same name and in associating different names for the same place. Further, since gazetteers and geographical (map) displays are becoming available for use in a digital networked environment, the tools for putting latitude and longitude to use are at hand. A current project, "Going Places in the Catalog: Improved Geographical Access" , supported by an Institute of Museum and Library Services National Library Leadership Grant, explores what could be achieved by augmenting online catalogs by coupling them with gazetteers and map visualizations. A gazetteer, in library terms, is a placename authority list, and a catalog-friendly gazetteer would reflect cataloging rules for preferred choice of placename. For Canadian, U.K., and U.S. libraries this means following chapter 23 of the Anglo-American Cataloging Rules , which prescribes the use of English forms of placenames, but only if well-established. Hence Germany for Deutschland, but Braunschweig not Brunswick. Of use for this project could be the existing geographical data in library catalog records. In about one-third of MARC records, the geographical scope of the document is encoded in field 043; e.g., e-lu indicates Luxemburg. Also classification numbers commonly incorporate geographical codes. The "7.946" within the Dewey number 917.94604 for a guidebook indicates that it is about the San Francisco Bay Area. We have yet to find an online catalog that supported the use of these data when searching. Directories of named time periods are not a developed genre, but the chronological subdivisions of LCSH (indicated by $y in MARC displays) constitute, in effect, a kind of time period directory. There are, for example, a set of "civil war" periods: 49-48 BC (Rome); 1642-1649 (Great Britain); 1861-1865 (United States); 1936-1939 (Spain); 1945-1949 (China); 1967-1970 (Nigeria); 1970-1975 (Cambodia); and others. These points in place and time could be displayed on a map or on a timeline and used as a search aid. Geographical information systems allow structured data with spatial coordinates to be visualized as map layers in a common coordinate system. Multiple map layers, showing topography, linguistic zones, and trade routes, for example, can be superimposed in a single environment for viewing and analysis, to contextualize the results of spatially referenced bibliographic searches. In one prototype, a set of library catalog records in the Cebuano language and/or concerning the Cebu region of the Philippines was harvested internationally using the Z39.50 protocol. Latitude and longitude for places of publication and places named in subject headings were added from gazetteers to create two layers of dots on a map-visualization with two language maps. Clicking on a dot retrieves catalog records including library location . Another map-based prototype retrieves records for news reports concerning individual cities in India. Clicking on a city retrieves a list of brief bibliographical records for reports relating to that city; clicking on any record in the list causes the text of the article to be displayed . (See Figure 1.) Both prototypes also incorporate an adjustable timeline to support search by time as well as place. Figure 1. Map interface for retrieving news reports relating in cities in India . Red dots mark cities mentioned in news reports. Clicking on a city generates a list of news reports (lower right). Clicking on a listed report retrieves the text (top right). To see a larger version of Figure 1, click here. Interactive map visualizations can be used to define arbitrary areas of interest (by clicking on pre-defined areas or drawing bounding boxes), including regions that have informal or conceptual names, such as The Midwest or Silicon Valley. Having prescribed a region, the latitudes and longitudes within the area can be referred to a gazetteer to identify all named places in (or near) the defined area to support a text-based search in the catalog, or elsewhere, for each of these placenames. An online gazetteer should also be searchable by feature type, which could be used to generate sets of placenames for searching in the catalog or elsewhere. Similarly, through inspection of geographical coordinates (latitude and longitude), spatial relationships could be calculated in the form: "Find places within 50 miles of Fresno, CA." Such a command would be especially useful in borderland areas and for identifying closely related places that are, or once were, separate, such as Buda and Pest, and Detroit, MI, and Windsor, Ontario. Linking online catalogs with online gazetteers could transform geographical searching. Search results could be visualized and new kinds of queries supported with map-displays. The lingua franca of latitude, longitude, and time can extend searches to other digital library resources relating to the same locality. Storage in a digital environment reduces all media (audio, numeric, text, images, and video) to a technological base of bits. Despite the uniform base, search across media is really hard in a digital environment. Automated searches cannot be done directly. A fragment of text can be used to search in a text file, but not among images or statistical data series. Nor can fragments of images or of numeric data be used as a query in text files. Searching across different digital media can, at best, be done indirectly. The headings, row stubs, captions, and legends in numeric datasets can be used as a textual surrogate and searched as text queries, but such a search is unlikely to be reliable given the vagaries of language. But if both texts and captions can be associated with values in a topical knowledge organization system (KOS), such as the Library of Congress Subject Headings (LCSH), then these topical values can be used as a pivot to go from text to topically related numeric data, or vice-versa (Figure 2). Although we speak here of linking an online catalog with a topical KOS and a gazetteer and a time period directory, we envisage an environment in which online catalogs (and bibliographies) will interoperate with multiple network accessible resources of these types, and with other resources that become searchable because of data made available from KOS resources (topics, gazetteers, time period directories, etc.). As methods were developed for integrating distributed resources to create multi-dimensional cultural collections linked by time and place, major concerns of the ECAI community surfaced. How can scholars get credit for the additional work it takes to create such projects? And, how can these efforts be preserved over time? To address these issues ECAI, in collaboration with the California Digital Library, developed an electronic publications program. The goal of the ECAI ePublication Series is to provide stable, long-term access to peer reviewed, map-based digital scholarship in history and the humanities. These publications include text, images, dynamic downloadable maps, and time bars. Standards and processes for creating the publications include conducting peer reviews of both their technical architecture and scholarly content, with an emphasis on the design of maps that can be effectively integrated into publications. The project also explores more broadly the issues of electronic scholarly publication. Currently there are two publications online in the Series: A Sasanian Seal Collection in Context and Mapping the Mainline: Using Historical GIS to Study American Religion . Another project is the ECAI Iraq Cultural Atlas  which is featured elsewhere in this issue. The most fundamental advantage of the emerging networked knowledge environment is that it provides a much-improved technological basis for sharing resources of all sorts from all sources. This situation increases the importance of effective access to information. Place, along with time, topic, and creator, is one of the fundamental components in how we define things and search for them. In addition, place is pivotal for interdisciplinary inquiry and latitude and longitude constitute a lingua franca across all disciplines and all countries for specifying places. Archaeologists, anthropologists, botanists, civil engineers, economists, epidemiologists, geologists, historians, manufacturers, military strategists, sociologists, and others form their specialized communities and domain-specific terminology. Since they are all more or less interested in space and place, and in change over time, it is particularly effective to bring together everything associated with a particular place at a given time in order to understand the relationships between the communities and the broader context. This article reports the work of several people, especially Aitao Chen, Melanie Feinberg, Fredric C. Gey, Kim Carl, Ray R. Larson, Vivien Petras, Ruth Mostern, Susan Stone, Jeannette L. Zerneke, and many more in the extended ECAI community. Support from the following is greatly appreciated: The Lilly Endowment, the National Science Foundation, the Institute of Museum and Library Services, the Luce Foundation, the California Digital Library, and, at the University of California, Berkeley, the Dean of International and Area Studies and the Center for Information Technology in the Interest of Society. Electronic Cultural Atlas Initiative. 2004. [Website] <http://www.ecai.org/>. Lancaster, L. R. and D. Bodenhamer. 2002. The Electronic Cultural Atlas Initiative and the North American Religion Atlas. In Past Time, Past Place: GIS for History, edited by Anne Kelly Knowles. Redlands, CA, ESRI Press (163-178). Electronic Cultural Atlas Initiative. ECAI Metadata Clearinghouse. Available at <http://ecai.org/tech/mdch.html>. University of Sydney. Archaeological Computing Laboratory. TimeMap®. Available at <http://acl.arts.usyd.edu.au/research/time_map/>. Electronic Cultural Atlas Initiative. TimeMap®. Available at <http://ecai.org/tech/Timemap.html>. Electronic Cultural Atlas Initiative. 2002. A Multilingual Gazetteer System for Integrating Spatial and Cultural Resources. Project funded by NSF IM/ITR grant 0114019, September 2001 through August 2002. Principal Investigator: Lewis Lancaster. Available at <http://ecai.org/projects/gazetteer/nsf_multisys_abstract.html>. Chen, Ya-ning Arthur, Shu-juin Sophy Chen and Wei-long Ueng. 2002. Digital Gazetteer Service in Context of Chinese Culture, PNC, Osaka, 2002. Available at <http://pnclink.org/annual/annual2002/pdf/0921/6/m210603.pdf>. Hill, L. L., J. Frew, and Q. Zheng. 1999. Geographic Names: The Implementation of a Gazetteer in a Georeferenced Digital Library. D-Lib Magazine 5, no 1 (January 1999). Available at <doi:10.1045/january99-hill>. Hill, L. L. 2004. Guide to the ADL Gazetteer Content Standard, version 3.2. Available at <http://www.alexandria.ucsb.edu/gazetteer/ContentStandard/version3.2/GCS3.2-guide.htm>. Janée, G. and L.L. Hill. 2003. The ADL Gazetteer Protocol. Available at <http://www.alexandria.ucsb.edu/gazetteer/protocol/specification.html>. University of Virginia. Tibetan and Himalayan Digital Library. Available at <http://iris.lib.virginia.edu/tibet/collections/cultgeo/gazetteer-frameset.html>. Harvard University. Chinese Historical GIS Project. Available at <http://www.fas.harvard.edu/~chgis/>. Feinberg, M. 2003. Application of Geographical Gazetteer Standards to Named Time Periods. Available at <http://ecai.org/imls2002/time_period_directories.pdf>. HumanSaga: Plotting the Course of History. 2000. Available at <http://www.humansaga.com/>. Wikipedia. List of Themed Timelines. 2004. Available at <http://en.wikipedia.org/wiki/List_of_themed_timelines>. Electronic Cultural Atlas Initiative. 2002. Going Places in the Catalog: Improved Geographic Access. Available at <http://ecai.org/imls2002/>. Anglo-American Cataloging Rules. 1998. Edited by Michael Gorman and Paul Winkler. 2nd, 1998 revision. Chicago: American Library Association. Electronic Cultural Atlas Initiative. 2003. The Cebuano Language Atlas. Available at <http://www.ecai.org/imls2002/cebuano/CebuanoIndex.html>. Electronic Cultural Atlas Initiative. 2003. Hindi Surprise Language Project. Available at <http://ecai.org/imls2002/hindi/HindiDocRetrieve.html>. Buckland, M. K., F. C. Gey and R. R. Larson. 2002. Seamless Searching of Numeric and Textual Resources. Final Report on Institute of Museum and Library Services National Leadership Grant No. 178. School of Information Management and Systems, University of California, Berkeley. Available at <http://metadata.sims.berkeley.edu/papers/SeamlessSearchFinalReport.pdf>. Electronic Cultural Atlas Initiative. 2003. ePublications. Available at <http://ecai.org/projects/epublications.html>. Electronic Cultural Atlas Initiative. 2004. ECAI Iraq. Available at <http://www.ecai.org/Iraq/Iraqtest8-7.html>.